Did you know the average person consumes 612 pounds of dairy products a year?! The USDA indicates that we consume the most fluid milk/cream and cheese! Dairy products are high in calcium, potassium, and vitamin D. Something I thought was interesting, the consumption for butter and reduced fat ice cream has increased, while fluid milk consumption has decreased. 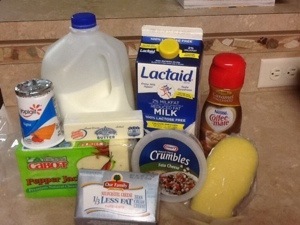 Just for fun we pulled all the dairy products out of our fridge for a photo – how many products are in your fridge? What is your favorite way to consume dairy products? Next Stepping on the scale and ear piercing time!